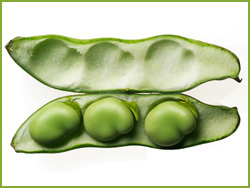 June brings us spring beans and peas, food festivals and plans for future dining! Season’s Eatings – what foods are in season for June? Guess What, WE ONLY FLIPPING WON! We told you last month that we had made the short list in the Home & Garden category of the Wakefield Retail Awards. Well the awards dinner was on 17th May and to our enormous surprise (and delight) we actually won it! Unaccustomed as we are to public recognition, it was all a little out of our comfort zone but definitely something we could get used to. MD Dean Clements collected the award. Other winners on the night included Time Bakery (Food & Drink category), Wakefield Hospice (Voluntary Sector) and Boots (National Retailer). According to the judges it was our customer service that we offer which secured our win which is something that makes us very proud. You can see more about the awards here. Spring and summer bring with them some great local food festivals. The ninth annual Leeds Food and Drink Festival is a massive 17 day event this year. It started on 23rd May and will conclude with a 3 day festival finale show in Millennium Square 6-8 June. Here’s an overview of what you can expect. Sadly no restaurant reviews from May to include this time but a couple of restaurants in Wakefield have come to my attention lately that I’d like to try out soon. Lebardo is a French restaurant on Providence Street that looks really nice and we must be big meat lovers here in The Shake as there is yet another American burger/BBQ style restaurant now; Hogs Restaurant in Trinity Business Park. I wonder how it compares to The Grill Pit and Smokehouse? I shall endeavour to find out! 0 Responses to "The 3Style Foodie Blog – June"